Love Urban Decay Primer Potion? Well, this may just be your lucky day. 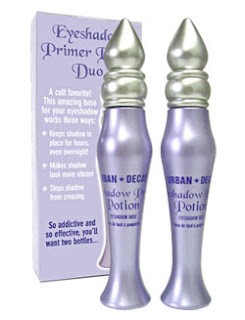 Because right now, Urban Decay is offering up not one but two tubes of the stuff in their Eyeshadow Primer Potion Duo. They don't call it a cult favorite for nothing -- eyeshadow and cream liner just don't budge. You can dance, you can run, you can skip ... you can even sleep on it. So how could I not get super excited about the fact that now it comes in a fabulously convenient duo? Now I get not one but two tubes of the creamy goodness. This duo is available for $25 at urbandecay.com. When you consider that one tube retails for $16, you're definitely getting a bargain!